In 1908, Max Martin Fisher is born, and the following year, his father, William, buys a clothing store in Salem, Ohio. Max grows up in Salem, entering high school in 1923 and excelling in football. In 1926, Max graduates high school and enrolls at Ohio State University on a football scholarship. He joins a mostly Jewish fraternity, and when he loses his football scholarship due to injuries, he delivers ice to cover his expenses. In 1930, Max graduates from Ohio State University and moves to Detroit, where his parents and sisters have relocated. Max is hired by his father as a salesman for Keystone Oil Refining Company plant in 1931. In 1933, Max finds an investor, Henry E. Wenger, for his plan to build a refinery. Max marries Sylvia Krell in 1934, and in the wake of the fuel scarcity in 1938, he makes one of the savviest business deals of his career. Max’s business, the Aurora Gasoline Company, continues its success throughout the 1950s. In 1952, Fisher’s wife Sylvia passes away, and he marries Marjorie Switow Frehling in 1953. Max travels to Israel in 1954 on a UJA study mission, piquing his interest in fundraising upon his return. In 1955, Aurora buys out the quarter interest held by Keystone Oil Refining Company, William Fisher’s business. Max becomes more involved in Detroit’s Jewish community, serving as President of the Jewish Welfare Federation and joining a United Jewish Appeal mission to Israel and Europe. On the business front he merges Aurora Gasoline with The Ohio Oil Company, the latter becoming Marathon Oil Company in 1962. Max is very active in helping improve Detroit. In 1964, he becomes President of Detroit’s United Foundation. He also expands his service in the Jewish community, taking leadership positions and running successful fund-raising events. In 1965, he negotiates a $50 million loan from 11 insurance companies to the support the Jewish Agency for Israel, being elected its General Chairman later that year. Max is appointed Chairman of New Detroit in 1968, founded to address the city’s racial tensions that culminated in the riots of 1967. Max’s political involvement increases, as he is named the finance chair for George Romney’s bid to win the Republican Presidential nomination and attends the Republican National Convention as a delegate-at-large from Michigan. Once Richard Nixon wins the Republican nomination, Max works on his campaign. Max’s reputation in Detroit’s business community continues to grow, and politically, he continues to establish himself as an integral link between President Nixon and the Jewish community, helping to ease tensions brought about by Secretary of State William Rogers’ Middle East peace plan. In 1970, Max is a key figure in reaching consensus among the World Zionist Organization and the Jewish American community, and a founder of the Detroit Renaissance in an effort to revitalize inner city Detroit. In 1972, Max is awarded the Presidential Star for his support and fund-raising in Nixon’s re-election campaign. Max continues to work with the Nixon Administration while the Watergate scandal grows. After Nixon resigns, Max travels to Israel in 1975 to help President Gerald Ford and Secretary of State Henry Kissinger understand that their goals for Middle East peace were shared by Israeli leaders. Max backs his friend Al Taubman’s purchase of the 73,000 Irvine Ranch. In 1976, Max plays a major role in Ford’s re-election campaign, helping him to get 45% of the Jewish vote in an unsuccessful bid for a second term. The Renaissance Center opens, and the Wall Street Journal runs a feature article about Max. He retires as Chairman of the Board of United Brands, and in late 1979, presents his friend Henry Ford II with the first UJA Humanitarian Award. Max works with Leon Dulzin to solidify the Zionist and philanthropist factions of the Jewish Agency for Israel, and he receives an award from UJA for his role in its reconstitution. His work with President Reagan escalates, as he meets with the President and other Republican leaders to discuss growing anti-Semitism and the sale of AWACS to Saudi Arabia. 1982 brings success for Max’s business holdings, as his ownership in the Irvine Ranch is bought out, and U.S Steel purchases Marathon Oil. His labor of love for the city of Detroit, the Riverfront residential project, breaks ground. 1983 is a year of honors for Max. He invests in a professional football team with his friend Al Taubman, which won the USFL championship. In the mid-1980s, Max continues to garner service awards and find success in fundraising. In 1984, the US Department of Housing and Urban Development presents Max with a Certificate of Appreciation for his work in Detroit. On a personal note, he is bar mitzvahed in Jerusalem. His “Fisher Meeting” events raise more than $17 million for the Allied Jewish Campaign. In 1988, Max and Marjorie honor President Richard Nixon at a private dinner at their home, and Max speaks at the GOP National Convention on behalf of the National Jewish Republican Coalition. President Reagan speaks at a dinner celebrating Max’s 80th birthday. Max continues to lend his expertise to the Presidential office, forming the “No Name Committee” and meeting with President George H.W. Bush to discuss the emigration of Soviet Jews to the U.S. Max is appointed to the President’s Export Council. In early 1992, Peter Golden’s biography of Max’s amazing life, Quiet Diplomat, is published. The Jewish Federation of Metropolitan Detroit opens its headquarters in the Max M. Fisher building, and later that year, Detroit Monthly magazine names Max the second most powerful person in the city. Max’s generosity and philanthropy continue, as he announces a $20 million gift to the Ohio State University College of Business to help construct a multi-building campus to house the renamed Fisher College of Business. In July 1998, Max celebrates his 90th birthday with a black tie dinner with friends and family. Later that year, the Jewish National Fund names a 10,000-tree forest outside of Jerusalem in honor of him. At the age of 91, the Detroit News names Max the 2000 Michiganian of the Year. His donation to the Detroit Symphony Orchestra allows them to open the Max M. Fisher Music Center, prompting the Detroit Free Press to run a front page tribute to Max entitled “The Amazing Life of Max Fisher.” In March 2005, Max dies of natural causes at his home in Franklin, Michigan. On June 2, 1906, Velvil Fisch departed from Antwerp, Belgium for New York City where he changed his name to William Fisher and set off for Pittsburgh. On August 24, 1907, Malka Fisch arrived to Baltimore to join her husband in Pittsburgh, changing her name to Mollie Fisher. Max Martin Fisher was born to William and Mollie Fisher on July 15, 1908. In 1909, William Fisher bought a clothing company in Salem, Ohio. In 1923, Max Fisher entered high school where he was an average student (though excelling in Math and History) and, at 6'2", a standout lineman for the football team. His nickname was Rabbi. In the winter of 1925, William Fisher sold his business in Salem and moved the family to Cleveland. Max moved in with his Uncle Ben's family to finish high school in Salem. In June 1926, Max Fisher graduated from Salem High School and, having made the all-county team, was offered a football scholarship by Ohio State University. At Ohio State University, Max Fisher joined the nonsectarian, mostly Jewish Alpha Epsilon chapter of Phi Beta Delta. After losing his football scholarship to injuries, Max Fisher delivered ice for City Ice and Fuel to pay his expenses during college. In the Great Depression that succeeded the stock market crash of October 29, 1929, William Fisher lost his business. He moved the family to Detroit and invested in Solaray Sales and Manufacturing Corporation, a friend's lubricating oil company. On June 10, 1930, Max Fisher graduated from Ohio State University and, later that day, set off to meet his family in Detroit. After helping his father with the relocation of the Keystone Oil Refining Company plant, William hired Max as a salesman in 1931. With insurance money from the accident, William Fisher bought out most of his partners and became President of Keystone. After saving a dollar a week in a Christmas club, Max Fisher and friend Joe Falk had enough to visit Cuba in late December 1932, Fisher's first time on an airplane. He returned to Detroit to find the Keystone plant had burned down. 1933 and 1934 were transformative years: after Max Fisher secured Henry Wenger's investment, he acquired used equipment from The Ohio Oil Company and land from his father's company, Keystone. Max oversaw the construction of the new Aurora refining plant, which was immediately successful, turning a profit in its first month. In 1933, after his father refused his business plan to build a crude oil refinery, Max Fisher took his idea to Henry E. Wenger, founder of Aurora Gasoline Company, who agreed to invest in the business. On October 4, 1934, Max Fisher and Sylvia Krell were married. In 1938, sensing a bind on oil access, Max Fisher negotiated the deal of his career with James Donnell II of The Ohio Oil Company, offering to pay the posted price for crude oil, an unheard of proposition, for exclusive access. During World War II, fuel was scarce, but Donnell kept his word and Aurora maintained a crude oil supply from The Ohio Oil Company. By the end of the war, Aurora was among the largest independent petroleum companies in the Midwest. By purchasing its best customer, Speedway 79 gas stations, in 1947, Aurora became fully integrated. A lifelong congenital heart disease finally killed Max Fisher's wife Sylvia on June 22, 1952, leaving Max and their daughter, Jane. Max Fisher and Marjorie Switow Frehling were married on July 1, 1953. In October 1954, Max Fisher went to Israel with the first United Jewish Appeal study mission, where he met Finance Minister Levi Eshkol who told him, "Israel exists so Jews may exist." In 1955, Aurora bought out Keystone, the business owned by Max's father, William, and his partners. William and Mollie moved permanently to their favorite vacation spot, Miami Beach, in 1957. Max Fisher became Chairman of the Board of Aurora Gasoline Company effective January 1, 1957. Max Fisher, Chairman of JWF, raised $5,841,000 during Detroit's most successful Allied Jewish Campaign of its history. Max Fisher served as President of Detroit's Jewish Welfare Federation from 1959 to 1964. In the summer of 1959, Max Fisher negotiated another successful deal with his old business associate James Donnell II, merging Aurora with The Ohio Oil Company. Max Fisher participated in the seventh United Jewish Appeal Study Mission to Israel and Europe. Max Fisher is appointed chairman of Detroit's 1961 United Foundation Torch Drive, raising a then-record $19.5 million. A scroll from Yeshiva University commemorating Max Fisher's service as a Diamond Jubilee Ambassador at the 75th Anniversary celebration. In 1962, The Ohio Oil Company adopted the name of its main brand and became Marathon Oil Company. Max Fisher is among 14 Detroiters included on United Jewish Appeal Overseas Study Mission to Europe and Israel. Detroit's Jewish elite honor Israel Minister of Education Abba Eban with private dinner (Max Fisher was chairman of the event). In late 1962, Max Fisher was a principal purchaser of the Fisher Building in Detroit. Max always admired the building and wanted ownership to remain with a Detroiter. Max Fisher 14th recipient of Fred M. Butzel Memorial Award (highest honor) by Jewish Welfare Federation of Detroit in 1964. Max Fisher elected President of Detroit's United Foundation (then the nation's largest community chest organization). Max Fisher was elected the General Chairman of the United Jewish Appeal at the 27th annual conference in New York City. He will retain this position unitl 1967. Max Fisher negotiates a $50 million loan from eleven US insurance companies to support the Jewish Agency for Israel. In 1965, to commemorate the twentieth anniversary of V-E Day, the United Jewish Appeal presented Chairman Max Fisher with the master models of the UJA Medal. Max Fisher, General Chairman of the United Jewish Appeal, gives an address at the 34th Annual general assembly of Jewish Federations and Welfare Funds. Israel launches a surpise bombing campaign against Egyptian airfields. After a series of stunning victories, Israeli forces capture control of the Gaza Strip and Sinai Peninsula from Egypt, along with the West Bank and East Jerusalem from Jordan and the Golan Heights from Syria. The Detroit riots, which began on July 23, 1967 led to 43 deaths, 7,200 arrests and a minimum of $42.5 million in damages. In September 1967, Detroit Magazine published a feature profile on Max Fisher. Max Fisher is finance chair for George Romney's campaign to win the Republican Presidential nomination. Max Fisher was awarded an Honorary Doctorate from Bar-Ilan University in Israel. After serving as General Chairman of the United Jewish Appeal since 1964, Max Fisher was elected President of the UJA. Max Fisher attends the Republican National Convention in Miami as a delegate-at-large from Michigan. After the convention he contacts Nixon to offer his help and support. Max Fisher named Chairman of New Detroit, Inc. founded after July 1967 riots. In February 1969, The Detroit News Magazine published a feature profile on Max Fisher. In 1969, President Nixon created the National Center for Voluntary Action and named Max Fisher its chairman. Chosen President of the Council of Jewish Federations and Welfare Funds. 1969: Chosen President of the Council of Jewish Federations and Welfare Funds. Max Fisher attained the highest position in the American Jewish community by being chosen President of the Council of Jewish Federations and Welfare Funds. Max Fisher reads a letter from President Richard Nixon to the National Emergency Conference on Peace in the Middle East in Washington DC. The delegates are concerned that the Nixon Administration, including Secretary of State William Rogers, are becoming pro-Arab. Nixon's letter is well received by the delegation, though tensions among American Jews toward government Middle East policy persist. Meeting in the White House on the "Rogers Plan"
1970: Meeting in the White House on the "Rogers Plan"
Max Fisher arranged an audience of 43 influential American Jews to discuss Israeli foreign policy in the Middle East with Secretary of State William Rogers. Elie Wiesel delivers the keynote address at the 39th General Assembly of the Council of Jewish Federations in Kansas City. Max Fisher was instrumental in the founding of the Detroit Renaissance. He served as Chairman from 1970-1981 and 1983-1986. Max Fisher was instrumental in the founding of the Detroit Renaissance. He served as Chairman from 1970-1981 and 1983 -1986. Nixon intervenes on behalf of "Leningrad 11"
1970: Nixon intervenes on behalf of "Leningrad 11"
Max Fisher and Jewish leaders meet with congressmen and Secretary of State William Rogers to discuss the fate of Soviet Jews who are trying to immigrate to Israel. Nixon agrees to meet wth the group and arranges for death sentences hanging over the "Leningrad 11" to be commuted. Honorary Doctorate of Humane Letters from Michigan State University in 1971. Honorary Doctorate of Law from Ohio State University in 1971. Max Fisher ,Chairman of the Detroit Renaissance, delivers an impassioned speech titled, "What Can We Do for Detroit?" at the Economic Club of Detroit. An engraved copy of the front page of the Detroit News on July 15, 1971, which featured Max Fisher as an "ultimate philanthropist" and one of the city's most important "movers and shakers." Max Fisher is elected Chairman of the Board of Governors of the Reconstituted Jewish Agency. He addresses the the final session of the Founding Assembly with a speech titled, "The Tasks Before Us." A helicopter carrying Max Fisher and Henry Ford II made a forced landing in the middle of the Sinai Desert, no one was hurt. The Presidential Star was awarded to Max Fisher by President Nixon in appreciation for his support in the President's successful reelection campaign of 1972. Fisher raised over $11 million for Nixon's three campaigns in the 1960s and 1970s. Max Fisher was one of the eight original members of Nixon's 1972 re-election committee. He focused on the Jewish vote, which he courted with unprecedented success for a Republican candidate. This Medal of Merit from the Jewish War Veterans of the USA, awarded in 1973 to Max Fisher, "Compassionate Jew-American Patriot." Israeli Prime Minister Golda Meir and writer Elie Weisel address the Second Assembly of the United Jewish Agency. Max Fisher delivers a speech titled, "Three Unique Events." Max Fisher along with fifteen other American Jewish leaders meet with President Richard Nixon, Henry Kissinger and other members of the administration in the White House. The leaders requested that Nixon ask Soviet party leader Leonid Brezhnev to eliminate the "exit tax" for educated emigrants. It is widely acknowledged that Max Fisher’s role had a profound impact on the outcome of the 1973 Yom Kippur War. In the early days of the war, Israel suffered unprecedented losses as Egypt moved into the Sinai and Syria captured high ground in the Golan. Israel was in desperate need of U.S. military equipment; it had lost 20% of its fighter bombers, a total of 114 planes. Behind the scenes, Max was in constant communication with Israeli Prime Minister Golda Meir, and Israel’s U.S. ambassador, Simcha Dinitz. They knew that Max understood the gravity of the situation and had powerful contacts within the U.S. government. This was a matter of Jewish survival and he offered a direct conduit to the leadership of the United States government. Max went to the Oval Office and presented a letter to President Nixon from the Presidents of the Jewish Conference, representing leaders from a number of major Jewish organizations. ”Please send the Israeli’s what they need," Fisher told Nixon. "You can’t let them be destroyed.” When Fisher left the Oval Office, he went with the certainty that Nixon would resupply the Israelis. This critical intervention became a major turning point in the war. Richard Nixon resigns while facing certain impeachment after details of the Watergate scandal are revealed. His Vice-President, Gerald Ford takes over the office of President. 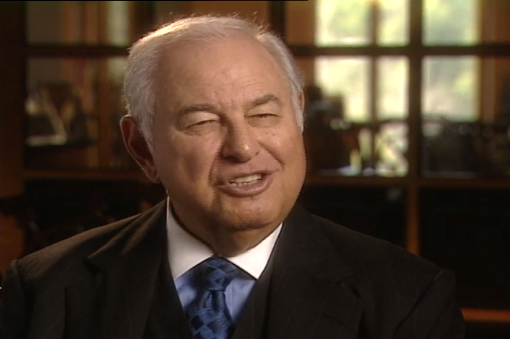 In 1975, Max Fisher, with Henry Ford II and others, backed Al Taubman's successful bid for the rights to the 73,000-acre Irvine Ranch in southern California, at the time the largest private real-estate holding in the country. Max Fisher accepts chairmanship of struggling New York food industry conglomerate United Brands Co. United Brands was facing SEC sanctions for bribing General Oswaldo Lopez of Honduras and other foreign officials. Fisher brought in his friends Seymour and Paul Milstein to help turn the company around. Max Fisher agrees to be the Finance Chairman of his good friend, Gerald Ford's presidential re-election committee. In January 1976, The Detroit Free Press featured an extensive interview with Max Fisher. At Max Fisher's suggestion, President Ford, courting the Jewish vote in his re-election campaign, addresses the American Jewish Committee's annual meeting in Washington, DC. Jimmy Carter wins the 1976 Presidential election. 1976: Jimmy Carter wins the 1976 Presidential election. Max Fisher played a major role in the Ford campaign which won an estimated 45% of the Jewish vote. Fisher described Ford's defeat as "…the most disappointing moment in my life." Fours year following the groundbreaking, downtown Detroit is transformed by a gleaming new development. The Renaissance Center replaced the old Packard warehouse, an abandoned rail yard and a grain silo. Max Fisher presents former President Gerald Ford with the plaque honoring Ford as a member of the Michigan Sports Hall of Fame. In 1978, The Wall Street Journal ran a feature article about Max Fisher titled "Quiet Operator." Max Fisher retired as Chairman of the Board of Directors of United Brands after steering the company profitably since 1975. The first United Jewish Agency Humanitarian Award was presented by Max Fisher, Chariman of the Jewish Agency Board of Governors and past UJA National Chairman to Henry Ford II. In 1980, Monthly Detroit magazine published a 12-page cover story about Max Fisher titled "Power Broker." Max Fisher gave the closing address, "To Build A Better Jewish Agency," at the 9th Annual Assembly of the Jewish Agency in Jerusalem on July 3, 1980. Max Fisher was instrumental in the presidential election of Ronald Reagan. The 1981 Morris J. Kaplun Prize was awarded to Max Fisher by Dropsie University. Max Fisher and Leon Dulzin organize the Jewish Agency for Israel's Board of Governors Conference in Jerusalem. Their goal is to solidify the two conlicted factions of the agency: the Zionists and the philanthropists. Fisher delivers an address to the conference attendees titled, "A Start For Change". The inaugural Jewish Statesmanship Award was presented to Max Fisher in 1981 by the United Jewish Appeal, for his essential role in the historic reconstitution of the Jewish Agency. In 1981, The New York Times published an Op-Ed by Max Fisher titled "Detroit - A Tale of Two Cities." Max Fisher along with 32 Jewish Republican leaders meet with President Ronald Reagan. They discuss growing anti-Semitism related to the debate over sale of AWACS to Saudi Arabia. Later in 1982, Donald Bren, co-chairman of Irvine Co. bought out Al Taubman, Max Fisher and their partners of all holdings in the Irvine Ranch. U.S. Steel purchased Marathon Oil in 1982 for $125 per share. Groundbreaking ceremony for the $77.4 million Riverfront residential project in June 1982. Max Fisher is awarded the Stephen S. Wise Award from the American Jewish Congress. Many of Fisher's friends including Henry Kissinger and Leonard Garment attend the award ceremony. In 1983, the Republican Party of Michigan honored Max Fisher, who was one of their most important contributors and instrumental in bringing the 1980 GOP National Convention to Detroit. Fisher also received the inaugural Western Michigan Republican Distinguished Service Award. In 1983, the Detroit Jewish News published an extended interview with Max Fisher as an excerpt from a book on North America's most successful Jewish businessmen. After 13 years of service, Max Fisher retired as chairman for the Jewish Agency's Board of Governors at the JA Assembly in Jerusalem in 1983. Al Taubman convinced Max Fisher to become an investor in his USFL football team, the Michigan Panthers. Though they only lasted two seasons, the Panthers won the first USFL championship game. "Max Fisher's 75th birthday was recognized by the Jewish Welfare Federation which dedicated The Jewish Community Foundation in his honor. " Max Fisher was bar mitzvahed at the Western Wall in Jerusalem. The US Department of Housing and Urban Development presented Max Fisher with a Certificate of Appreciation for his work in Detroit leading public and private sector cooperation in solving urban problems. International private enterprise by prominent Jewish businessmen to develop the Israeli economy, "Operation Independence," was announced by chairman Max Fisher in 1985. The 11th annual "Fisher Meeting" fundraiser nets $10.3 million in 1986. Max Fisher sculpture dedicated for permanent display at Jewish Community Center in West Bloomfield in 1987. The Shield of Zion Award from The American Zionist Federation in 1988. Richard Nixon is honored at a private dinner at the home of Max and Marjories Fisher. At the 1988 GOP National Convention in New Orleans, Max Fisher, chairman of the National Jewish Republican Coalition, gave an opening session address. President Reagan spoke at a GOP fundraiser and private dinner celebration in honor of Max Fisher's 80th birthday in Detroit in 1988. President Reagan honored Max Fisher with the Presidential Citizen Medal at the White House in 1989. The "No Name Committee," including Max Fisher, Shoshana Cardin and Bill Berman meet with President George Bush and his staff to discuss the emigration of Soviet Jews to the United States. $11.2 million pledged for the 1990 Allied Jewish Campaign at the 14th annual "Fisher Meeting." "Max Fisher was presented a plaque commemorating his participation in the United Jewish Appeal's Operation Exodus Campaign Inaugural meeting in 1990, where ""Prominent leaders of American-Jewish communities met in New York City to pledge their commitment and support for Soviet Jews settling in Israel in freedom and dignity."" During this meeting, Max Fisher talked with Walter Annenberg via telephone. Annenberg agreed to donate $15 million to the cause. " A plaque and certificate acknowledging Max Fisher as a founder of the Richard Nixon Presidential Library in Yorba Linda California, which was dedicated in 1990, and thanking him for "efforts to preserve the record of the extraordinary accomplishments of the Nixon Administration." Max Fisher among 28 appointed to President's Export Council by President Bush in 1990. Max Fisher presents former Secretary of State, George Schultz with the Human Rights Award from the Council of Jewish Federations in San Francisco. An honorary degree bestowed upon Max Fisher by the Technion Israel Institute of Technology in 1991, "In recognition of his outstanding leadership and generosity in all areas of Jewish life and his devotion to the advancement of humanity, the Jewish people and the State of Israel." In 1992, Peter Golden's definitive biography of Max Fisher, "Quiet Diplomat," was published. In 1992, the Jewish Federation of Metropolitan Detroit opened its new headquarters in the Max M. Fisher Building. In 1992, Max Fisher donated $1 million to the new United States Holocaust Memorial Museum in Washington. Max Fisher announces a $20 million gift to the Ohio State University College of Business. The gift will help construct a multi-building campus to house the renamed Fissher College of Business. The United Way of America's Alexis de Tocqueville Society Award in 1994. A colorful certificate from the World Zionist Organization commemorating the honorary planting, in Max Fisher's name, of 1,000 trees in the American Independence Park in Jerusalem. The Max M. Fisher Foundation gave a $25,000 grant to the Detroit Jewish Community Center to sponsor intergenerational programs in 1994. The 1994 "Fisher Meeting" raised a record $15 million for the 1995 Allied Jewish Campaign. Max Fisher was awarded the National Distinguished Leadership Award from The American Jewish Committee in 1994. The Republican Party honored Max Fisher with their first-ever American Spirit Award at a private dinner in Washington in 1997. Max Fisher made a $1.5 million endowment to establish the Fisher-Bernstein Institute for Leadership Development in Jewish Philanthropy at Brandeis University in 1997. A proclamation from the city of Salem, Ohio, Max Fisher's hometown, declaring July 15, 1998, Max Martin Fisher Day. In 1998, celebrations were held around the nation and in Israel in honor of Max Fisher's 90th birthday (including a symphony commissioned in his honor). A black tie dinner is held to honor Max Fisher on his 90th birthday. Friends, family and distinguished guests attend from all over the country. The Jewish National Fund named a 10,000 tree forest outside of Jerusalem in honor of Max Fisher. Ohio State University dedicated the new Fisher College of Business - a multi-building campus made possible by a $20 million donation from Max Fisher. Leslie Wexner, Chairman and Chief Executive of the Limited, honored Fisher with a $1 million donation to establish the Fisher Council on Global Trade and Technology. The Detroit News named Max Fisher, then 91, a 1999 Michiganian of the Year. At 94, Max Fisher was the oldest person on Forbes Magazine's listing of the 400 richest Americans in 2002. Using a large donation from Max Fisher, the Detroit Symphony Orchestra opened the innovative Max M. Fisher Music Center, devoted to youth music education and professional rehearsal space. On October 2, 2003, the Detroit Free Press devoted much of its front page to a tribute titled "The Amazing Life of Max Fisher" in light of the opening of the Max M. Fisher Music Center. On March 3, 2005 Max Fisher died of natural causes in his home in Franklin, Michigan. In April 2005, less than a month after Max Fisher's death, Ohio Senator George Voinovich addressed President Bush and the senate with an official Tribute to Max Fisher, declaring, "America has lost one of its finest citizens."